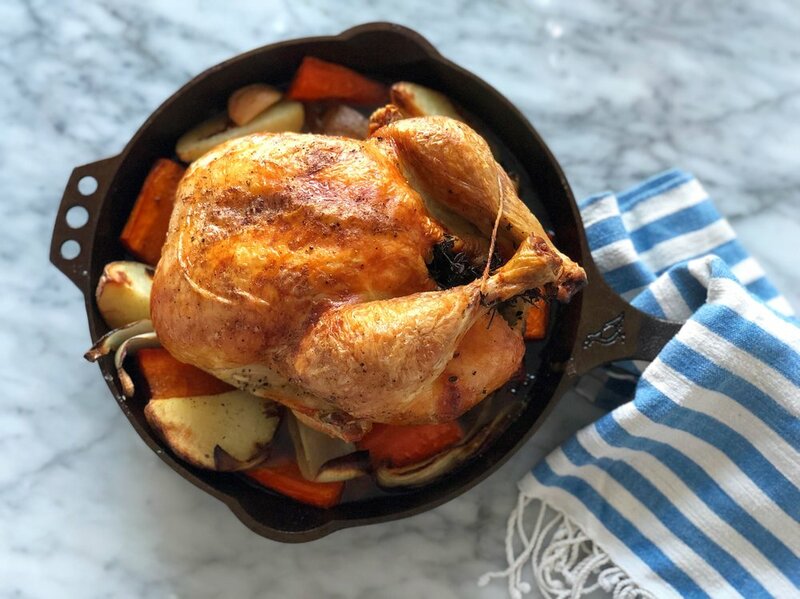 The perfect roast chicken is golden brown and crispy on the outside while tender and juicy on the inside and to achieve that (we’ve roasted and tested a whole lotta chicken over the years) we’ve found these steps to be super duper important: First, let your chicken sit at room temperature for about 30 minutes prior to roasting. This ensures even cooking all over. Second, let that bird rest for at least 10-15 minutes once it’s done roasting. This allows the juices to redistribute for the juiciest meat ever. And last but not least, BUTTER! Good quality, unsalted, high-fat butter from happy cows. Butter is what’s gonna give you that crispy skin and flavor. Oh and let’s discuss the veggies for a second. Yes it’s easier (and totally works) to throw the veggies and chicken in the pan and cook at the same time, but we often find that the veggies get too charred or overcooked. Our favorite method is tossing in the veggies midway through cooking. They still get all the flavor from the bird’s buttery juices and they’ll be fully roasted at 45 minutes. And while your chicken is resting, deglaze the pan of veggies with some white wine. Mmmm… Enjoy! Drizzle 1 tablespoon of olive oil in a large cast iron pan and place the pan on the lower rack of oven. Preheat the oven (and cast iron pan) to 400ºF. While the oven preheats, prepare chicken and vegetables. If needed, rinse the chicken and then pat dry with paper towels. Allow chicken to sit at room temperature for about 30 minutes prior to roasting. Sprinkle half of the kosher salt and fresh ground pepper all over and inside the chicken. Place the thyme, lemon and garlic cloves inside the cavity of the chicken. Tie the legs together with kitchen string and tuck the wing tips under the body of the chicken (this helps the chicken cook more evenly). Brush the chicken all over with butter and then sprinkle the remaining salt and pepper all over. Carefully remove the cast iron skillet and place the chicken inside; roast for 45 minutes. Meanwhile, toss veggies with 1 tablespoon olive oil, a pinch of kosher salt and fresh ground black pepper. At 45 minutes, carefully remove the roasting pan from the oven and scatter the veggies around the chicken. Continue roasting for another 45 minutes or until the chicken juices are running clear. A meat thermometer inserted into the thickest part of the thigh should read 165ºF. Transfer the chicken to a platter to rest for 10-15 minutes. While the chicken rests, place the pan of veggies on top of stove burner over medium-high heat. Drizzle in 1/4 cup of white wine and cook, scraping up any brown bits from the pan, for about 5 minutes. Carve the chicken and serve with veggies.